Jonah Lehrer plagiarism in Wired.com: An investigation into plagiarism, quotes, and factual inaccuracies. An investigation reveals evidence of plagiarism, dodgy quotes, and factual inaccuracies. 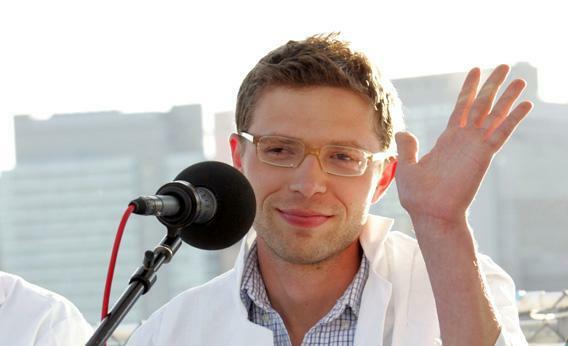 Science writer and contributor to Radio Lab, Jonah Lehrer attends the ‘You and Your Irrational Brain’ panel discussion at Water Taxi Beach in Long Island City in conjunction with the World Science Festival on May 29, 2008 in New York City. Photo by Thos Robinson/Getty Images for World Science Festival. For the past three months, Jonah Lehrer, science journalist, author of three books, and (former) New Yorker staff writer has been under siege. In mid-June, he was accused of recycling his old work and publishing it as new. Since then, a number of accounts assert that Lehrer committed the two mortal sins of journalism: fabrication and plagiarism. Before Lehrer joined The New Yorker, he was one of the premier bloggers at Wired.com; the site still boasts several hundred blog posts he wrote for his Frontal Cortex blog. Quite naturally, when the Lehrer scandal first broke, the editors at Wired.com worried that his work for them was tainted as well. That’s where I came in. I’m a journalism professor and science journalist, and though I’ve written for Wired once or twice (and I happen to know and like Wired’s editor, Chris Anderson), I was a relatively neutral, outside party who could check Lehrer’s blog for journalistic malfeasance. So Wired.com asked me to take a look. My task was not to decide whether Lehrer got everything right—every journalist makes mistakes and misinterprets things—but to determine whether he recycled, fabricated, plagiarized, or otherwise breached journalistic ethics. I soon came to the conclusion that he had. Wired.com decided not to publish my full analysis of my findings, but given the importance and prominence of the Lehrer case, Slate stepped in to fill the gap. Evan Hansen*, Wired.com’s editor, declined an opportunity to comment. (Update, Aug. 31, 8:32 p.m.: Wired has issued a statement.) Lehrer was asked to comment on the record but has not replied. I examined 18 out of several hundred postings; most were chosen by Wired.com editors as suspect, others were chosen by them randomly, and I selected a few additional blog posts to ensure that the sample wasn’t entirely under control of Wired.com editors. In this sample, all but one piece revealed evidence of some journalistic misdeed. Recycling was the norm (see the table of journalistic infractions, above). Sometimes Lehrer had reused sentences, paragraphs, or even multiple paragraphs. On occasion, a passage was recycled multiple times, appearing in several different pieces. As just one example, “Are Emotions Prophetic,” a blog post published in March about emotional versus rational thinking, borrowed language from two prior Lehrer publications: an article in ESPN the Magazine and a September 2011 blog post. Lehrer has been recycling his material for years; he was doing it in 2008 and probably even earlier. It’s amazing—and disturbing—that it took so long for anyone to notice. Journalists disagree about whether it is acceptable to take passages and quotations from press releases without attribution. I’m on the less-tolerant end of the spectrum, so I looked for examples in Lehrer’s work. In the sample of posts I looked at, there were a number of places where it looked like Lehrer had taken text from a press release and placed it in his own blog after a light edit. For example, several paragraphs in “Are Emotions Prophetic,” paralleled a Feb. 24, 2012, press release from the Columbia Business School. For me, the most ethically fraught example of this practice was in “Does Inequality Make Us Unhappy.” In that post, Lehrer wrote: “‘We economists have a widespread view that most people are basically self-interested and won’t try to help other people,’ Colin Camerer, a neuroeconomist at Caltech and co-author of the study, told me.” However, the quotation had come from a Caltech press release, not from an interview with Camerer. Journalistic rules about press releases are murky. Rules about taking credit for other journalists’ prose are not. The most extensive example comes from a blog post published on Sept. 28, 2011.The heart of this entry—four paragraphs—closely parallels a blog post written by Christian Jarrett a few months prior. A few weeks later, in another post, “The Psychology of Nakedness,” Lehrer used a paragraph that appeared previously, verbatim, in an article that appeared on LiveScience.com. In another experiment, the researchers varied the volunteers’ mindsets, sometimes asking them to look at photos as if they were on an online-dating website, focusing on attractiveness, and sometimes asking them to look at the photos as if they were hiring for a professional job, focusing on the mind. In a third post from mid-2011 titled “Basketball and Jazz,” one of Lehrer’s paragraphs closely paralleled one written by Newsweek science writer Sharon Begley some three years earlier. The rebounding experiment went like this: 10 basketball players, 10 coaches and 10 sportswriters, plus a group of complete basketball novices, watched video clips of a player attempting a free throw. (You can watch the videos here.) Not surprisingly, the professional athletes were far better at predicting whether or not the shot would go in. While they got it right more than two-thirds of the time, the non-playing experts (i.e., the coaches and writers) only got it right about 40 percent of the time. Tellingly, Begley misstated the number of participants in the study. (There were only 5 coaches and 5 sportswriters, not 10 of each. In addition, there were also 10 people in the novice group who were neither coaches nor sportswriters.) Lehrer made the exact same mistake in precisely the same manner. Lehrer has altered quotations, for instance of a written phrase in a scientific paper in “Basketball and Jazz.” Lehrer says that the scientists described a behavior as a “covert simulation of the action,” in quotation marks. The actual quotation, from a scientific paper, was that the subjects were performing “a covert simulation of the very same action” that was depicted on the video screen. In early August, Seth Mnookin of MIT pointed out a much clearer example of an improper quotation. In “The Psychology of Conspiracy Theories,” published in August 2010 (and republished in “Cognitive Dissonance” in January 2011), Lehrer told the story of a cult that believed that there would be a world-changing cataclysmic flood on Dec. 21, 1954. The leader of the cult received psychic “telegrams” from an alien presence, and Lehrer quoted what was supposedly part of the text from one of those missives. However, as Mnookin showed, the quotation was actually a pastiche—part of the passage was from an alien message, but part was a passage from Leon Festinger’s When Prophecy Fails, the main eyewitness account of the cult’s rise and fall. Mnookin pointed out other details that Lehrer gets wrong. For instance, in his Aug. 4, 2010, post, “The Psychology of Conspiracy Theories,” Lehrer wrote that the cultists believed that a cataclysmic flood would come soon after midnight. In fact, the flood was to begin at dawn. That error, by itself, would be of little consequence, but when Mnookin pointed out the error, Lehrer did not make a correction. What’s more, Lehrer republished the exact same erroneous information in “Cognitive Dissonance,” published some five months later. Psychologist Daniel Bor levels a very similar accusation. In 2009, Bor pointed out a piddling little error in a story that Lehrer had written for Nature—Lehrer claimed that a person had memorized the entire “Divine Comedy” after a quick read-through; in fact, the man had memorized only a few stanzas. Lehrer not only didn’t correct the mistake, but republished it not once but twice in his Wired.com blog. In my opinion, journalistic ethics are based upon trust; an ethical lapse is, at core, a breach of that trust. The severity of the sin depends on the severity of that breach and whose trust has been broken. There isn’t a canonical code of conduct for journalists; perfectly reasonable reporters and editors can have fundamental disagreements about what appear to be basic ethical questions, such as whether it’s kosher to recycle one’s own work. It’s generally expected that freelancers will try to resell stories—in the United States, freelance contracts often grant publishers “first North American serial rights,” with the explicit expectation that the writer will try to rework and repackage the piece for another publication. However, recycling may violate the reader’s trust. There’s an implicit assumption that a journalist’s work is somehow novel—that he adds something to the discussion through reportage or by synthesizing a new argument. But the nature of that assumption depends not just on how much material is recycled, but where and how it gets reused. There’s a continuum, as science writer Carl Zimmer explains; under certain circumstances, it can be perfectly fine, while in others, it can be shady or outright wrong. In Lehrer’s case, the extensive reuse of old material, coupled with his reliance on the appearance of novelty in his blog posts lead me to conclude that Lehrer crossed an ethical line with his recycling. Nevertheless, in my opinion, full disclosure, suitable penance, and a promise to sin no more would have been the appropriate response. Unfortunately for Lehrer, recycling was not the end of the story. To be fair to Lehrer, even as rigid an ethical rule as “no plagiarism” has shades of gray. I break with many of my colleagues when I say that it is unethical for a journalist to take unattributed text or quotations from a press release. Press releases, after all, are meant to be copied. Press officers are thrilled when reporters copy their prose—what better way for an institution to control a message than by putting words directly in a journalist’s mouth? But, in my view, this argument misses the real reason plagiarism is wrong. Unlike recycling, plagiarism and fabrication are fundamental betrayals of the reader’s trust. With plagiarism, an author tries to convince his audience that he has become conversant in a subject through journalistic research, processed that research, and distilled it by turning it into words on paper. Instead, a plagiarist merely takes someone’s thoughts or words and presents them as his own. With fabrication, an author tries to convince his audience of something that isn’t true, of an event that never happened, or a quote that was never uttered. Fabrication, like plagiarism, betrays the reader—and betraying the reader is the cardinal sin in journalism. I interviewed Lehrer for an hour and a half to get his reaction, but I am unable to publish his comments. Unfortunately, in the setup to the interview, Wired.com, which set the ground rules for the interview, didn’t make sufficiently clear that the discussion was not solely part of an internal investigation and that it could be made public. As a result, I can’t quote Lehrer or even paraphrase what he told me. But what I can say is that a number of his responses to my questions made me suspect that Lehrer’s journalistic moral compass is badly broken. In short, I am convinced that Lehrer has a cavalier attitude about truth and falsehood. This shows not only in his attitude toward quotations but in some of the other details of his writing. And a journalist who repeatedly fails to correct errors when they’re pointed out is, in my opinion, exhibiting reckless disregard for the truth. It is thus my opinion that Lehrer plagiarized others’ work, published inaccurate quotations, printed narrative details that were factually incorrect, and failed to address errors when they were pointed out. Lehrer’s transgressions are inexcusable—but I can’t help but think that the industry he (and I) work for share some of the blame for his failure. I’m 10 years older than Lehrer, and unlike him, my contemporaries and I had all of our work scrutinized by layers upon layers of editors, top editors, copy editors, fact checkers and even (heaven help us!) subeditors before a single word got published. When we screwed up, there was likely someone to catch it and save us (public) embarrassment. And if someone violated journalistic ethics, it was more likely to be caught early in his career—allowing him the chance either to reform and recover or to slink off to another career without being humiliated on the national stage. No such luck for Lehrer; he rose to the very top in a flash, and despite having his work published by major media companies, he was operating, most of the time, without a safety net. Nobody noticed that something was amiss until it was too late to save him. *Correction, Aug. 31, 2012: This article originally misstated the name of Wired.com’s editor, Evan Hansen.